I've been an intermittent camper/paddler since my teens, but when my kids were avid Boy Scouts, I caught the backpacking bug. Now that they have grown up, my wife and I plan to continue our adventures on the trail. I consider myself a mid-weight backpacker because I like comfort, but I can always learn to go lighter and longer. Color: N/A. The shirt I am testing is "palm green"
Craghoppers is a UK-based company that is focused around the production of "World Travel Clothing." For this test, I will be evaluating the NosiLife long-sleeved t-shirt, which is a product so new there is little information available about it on the company's website. From the hangtag that accompanied the shirt, the shirt is designed to provide "moisture control" and provide sun protection rated at UPF 30+. It is also noted to be lightweight and to be constructed of an "easy care, quick drying fabric". There is no information on odor control, so I am assuming this shirt does not have anything like that. On the UK version of the website, it shows that the shirt comes in "black pepper" (=dark grey) and "faded indigo" (=medium blue) in addition to the "palm green" I am testing. 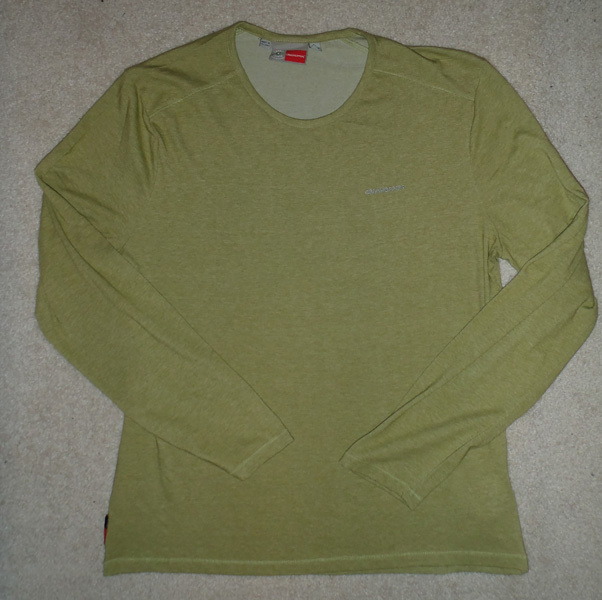 The shirt itself is a long-sleeved t-shirt meant to be worn as a baselayer. It is constructed of 61% polyester, 36% cotton, and 3% elastane, a composition which is indicated on a small tag on the inside of one of the seams near the bottom of the shirt. The shirt also is labelled "Insect Shield" repellent apparel, to keep away those nasty bugs. The chemical that makes this shirt bug-repellent is permethrin 0.52% w/w. 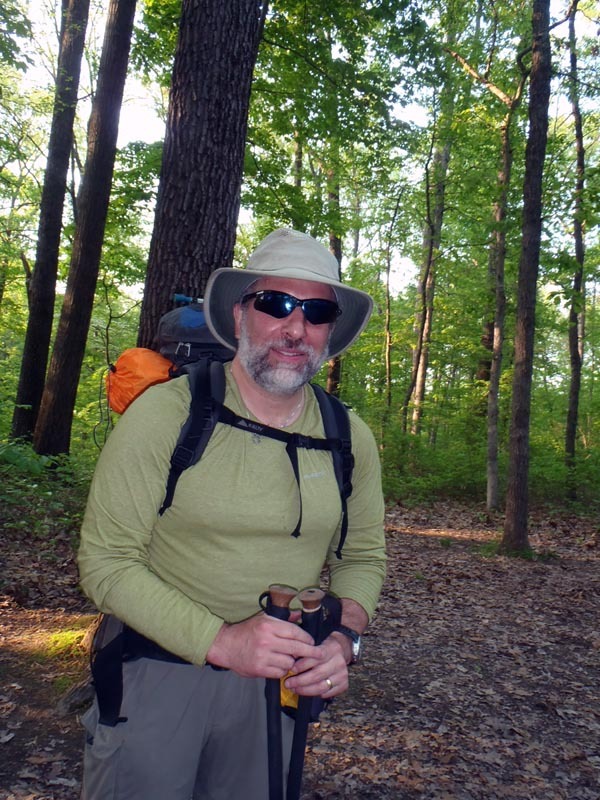 It is worth noting that the "Insect Shield" designation is not specific to Craghoppers items, as I have other camping/backpacking gear with this same treatment (such as the BugAway bucket hat I reviewed a few years back). There are also tags and designation from National Geographic, noting the connection between Craghoppers and the National Geographic Society. As an outdoorsman, I think this is a good thing, but I don't know it has much to do with the shirt itself. The shirt has standard construction for a t-shirt, with a double stitched round collar. The blended fabric feels soft and smooth. The seams appear sturdy and well-made. There is an embroidered "Craghoppers" on the left front chest area, and a small symbol on the left sleeve near the shoulder. Because these are embroidered with a greenish thread, they are barely visible on the background of the pale green shirt. Instructions for washing the shirt are provided in multiple languages (English, French, German, Dutch, Spanish) on the inside shirt tag which lists the materials. The tag simply reads (in English) "Wash dark colours separately. Do not bleach. Do not use fabric conditioners. Do not tumble dry. Cool iron. Do not dry clean. Do not iron on print. On the front of the tag, this information is also provided in symbols for experts, and large red letters read "KEEP AWAY FROM FIRE". It would have been handy to know if there were any issues with washing this shirt in a washing machine. 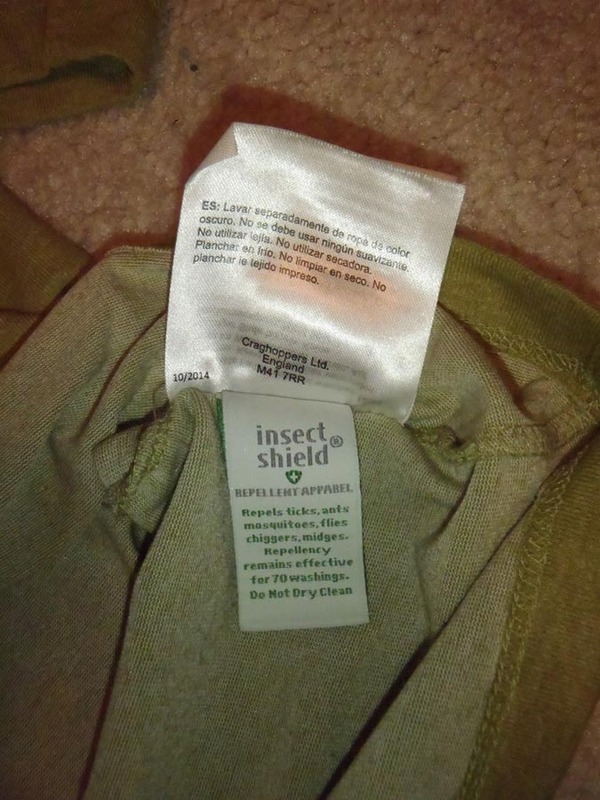 The attached tag describing the Insect Shield technology indicates that "Repellency remains effective for 70 washings. Do not dry clean." On the back of the tag it further states "Dispose of garment in trash. Wash separately from other clothing. Refer to hangtag for more information." The Insect Shield hangtag indicates that normal home laundering is recommended, and repeats the warning not to dry clean, as this will remove the active ingredient. In terms of a warranty, there is nothing that accompanied the shirt. The Craghoppers website "Returns" tab indicates a "100% guarantee." If the customer is in any way dissatisfied, the good can be exchanged or returned, provided they are unused and sent with the original labels and packing, including proof of purchase. Faulty items can also be returned, although more details are not provided. Another section of the website (the "Register Guarantee" tab) indicates that all clothing is guaranteed for life for faulty production, which (reasonably) does not include normal wear and tear or misuse. However, this is limited to items that were purchased directly from Craghoppers via the web or catalog. They recommend that all other problems be addressed by the location where the product was purchased. The shirt feels well made, and I am looking forward to taking it on the trail. I'm not really sure how warm this shirt will be on the trail, as there isn't much info available. This baselayer t-shirt seems fairly lightweight, so I'm expecting it will be quite comfortable in the warmer weather, and the sun protection is a bonus. I'm not quite sure yet if I will need to bring an extra long-sleeved shirt for warmth, though. I'm a little concerned about the use of a cotton blend in this shirt. Although I love to wear cotton for the comfort, it is usually something I avoid on the trail. I'll have to see if there are any issues as the test proceeds. Field Conditions and Experiences Over the past few months, I have taken the Craghoppers shirt with me on a bike ride and 2 backpacking trips. For the bike ride, I wore it as a baselayer on a 25-mile / 40-km bike ride in the spring, when temperatures were about 60 F / 15 C.
The first was a 3-day/2-night 18 mile / 29 km hike on the Zaleski Backpacking Trail in McCarthur, Ohio. Elevations were 750 -1000 ft (230 - 305 m), and the weather was sunny, with temps 65 F / 18 C overnight, up to 87 F / 30 C with HIGH humidity during the day. No wind either, so it felt really hot. The terrain was very up and down, especially during our 11 mi/ 17 km trek on Saturday. The second trip was a 3-day/2-night 16 mile / 26 km hike on the Adventure Hiking Trail in Corydon, Indiana. Elevations were between 450 and 850 ft. (137 - 260 m). The weather was again sunny, with temperatures between 75-92 F (24-33 C), and it also quite humid (60-70% most of the day). The terrain was similar to the first trip. The first time I wore the shirt was on the bike ride. The fabric is rather soft and quite comfortable. I felt like it did a good job blocking the wind on the ride as well. The weather on both backpacking outings was not good-too hot and humid. On the first trip, I wore the shirt the first night in camp, thinking that it might cool off. The weather stayed hot and humid, and so did I. It was really uncomfortable, but I'm not sure that any shirt would have been comfortable under those conditions. I wore the shirt on the third day of the trip, when I hiked about 5 miles/8 km out. The shirt kept the sun off my arms, but it was still unpleasantly hot. On the second trip, it was so hot the shirt never made it out of my bag. I would comment that the shirt packs down nicely in my backpack. Lastly, as described above, the shirt is treated to be bug repellent. Although it was hot and humid on the days I wore the shirt, I didn't really notice any problems with bug bites. However, I'm not especially sensitive to bites, and I don't think bugs were a huge problem for anyone else in the group. Thus, I'm not sure I can attribute my good fortune to the shirt. I will try to keep an eye on this as the test continues. I've worn the shirt a total of 3 days so far, and washed it twice so far. There is no visible wear and tear yet, but I can't say that it has gotten a lot of action so far. Overall, I like the shirt. It is comfortable to wear. I'm still not sure how warm it is, as each of my trips so far as been unusually hot. I'm going backpacking in the mountains next, so that should be a much better chance to see how this shirt does for me. Over the past 2 months, I took the NosiLife long-sleeve t-shirt as my warmth layer on an 11-day/10 night 80 mile (130 km) backpacking trip in the Sangre de Cristo Mountains near Cimarron, New Mexico. Elevations ranged from 6500-11800 ft (1980-3600 m). Temperatures ranged from a high of 80 F / 27 C during the day to a low of 40 F / 4 C overnight. We got rain on 4 days, including some extended rain lasting a few hours on 3 of the days. Although it wasn't especially cold most nights, it was chilly on the nights we camped above 8000 ft (2440 m), which was about 5 nights. On those evenings, I tended to put on the Craghoppers shirt when I got into camp, either by itself, or on top of another t-shirt. I found that the Craghoppers shirt plus a lightweight fleece kept me plenty warm down to the mid 40's F (5-8 C). On the night it was 40 F/ 4 C, I wore my raincoat on top and was fine. 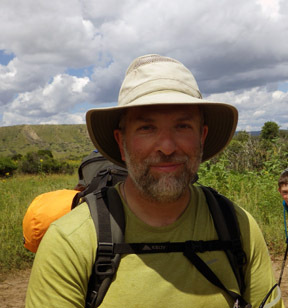 On the last day of the trip, I wore the Craghoppers shirt for the entire hike. We started early, so it was about 50 F (10 C). After a few minutes of warm-up, I was fine the rest of the day. It eventually was sunny and warm, but I did not feel overheated in the shirt, and the long sleeves actually protected me from sun exposure on my arms. 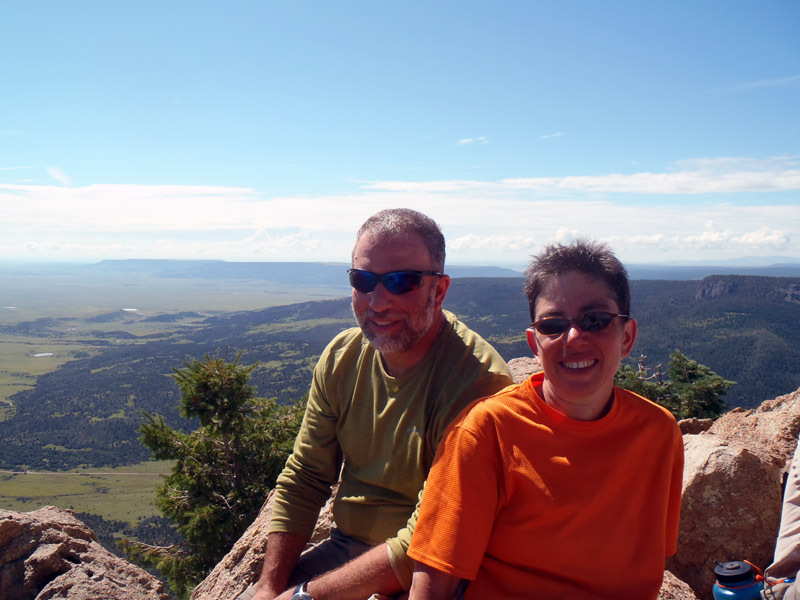 Here is a photo of me and the fabulous Mrs K enjoying the view from 9006 ft / 2745 m.
We also had a few days of rain on the trail. The first day it rained most of the afternoon, I got cold quickly when I got into camp. I put on my Craghoppers shirt as a dry underlayer, followed by a fleece. This enabled me to quickly warm up and I felt much better after that. Even after 11 days on the trail, the shirt was a little dirty but otherwise looked good (just like me!). More importantly, it did not have a strong odor, which is always a good thing! I didn't have any issues with bugs when I wore the shirt, although I'm not sure I can completely attribute this to the shirt. Could be, though. I have washed the shirt 4 times now (I washed it after taking it camping, even if I didn't wear it). It still looks great and has no obvious wear. Overall, I found the Craghoppers NosiLife long-sleeved t-shirt to be a comfortable baselayer shirt that kept me warm in cool temperatures. It does not have a "skin-tight" fit like some of my other baselayer shirts, and I generally liked this feature. This shirt will definitely join the rotation of backpacking gear for trips, especially when cool weather is expected. Thanks to Craghoppers for providing this shirt for testing, and to BackpackGearTest.org for giving me the chance to participate in the evaluation process.